The Original VALKYRIE has been officially discontinued & now on SALE for 60% off! What is available on this page are our FINAL remaining units, previously reserved for warranty replacements. A sleek & functional tool designed to help you soothe your mind, channel nervous energy, relieve stress, meditate, and induce focus when you need it the most. Valkyrie was created by our core team of passionate designer & engineers to be the perfect pocket-able heavy-duty EDC spinner. It is the product of a unique collaboration between ergonomic design, applied principles of rotational mechanics & aerodynamics, and user feedback from various communities of real enthusiasts. 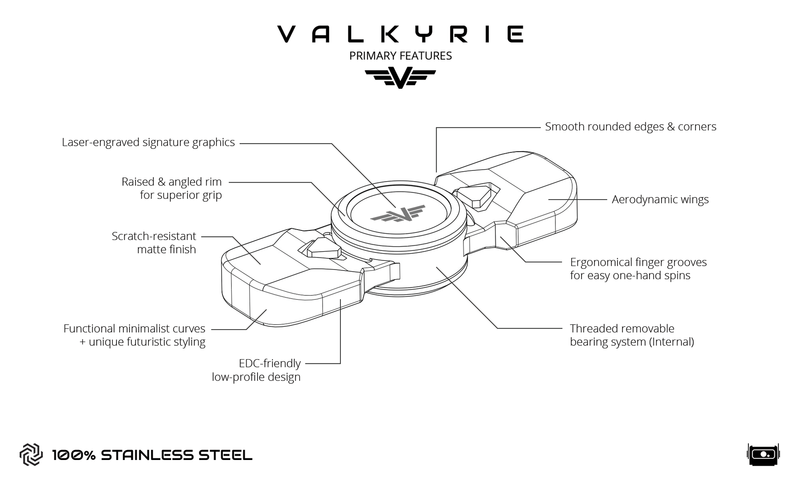 We built the Valkyrie for lifelong durability, reliable performance, long silent spins & a satisfying user experience. Each spinner is machined from a solid block of stainless steel, deburred of all sharp edges, and manually brush finished for a smooth, matte, scratch resistant texture. Valkyrie uses easily removable stainless steel R188 bearings, comparable in performance to larger ceramic 608 bearings, yet significantly quieter, much more durable, 100% shockproof, and easier to maintain. Grippy, laser engraved signature finger buttons/caps come standard, of course. Valkyrie’s superior quality & smooth futuristic curvatures are made possible by our use of state-of-the-art, high-precision 5-axis CNC machines, and has details simply not achievable by common 3-axis machines or manual tools. Every spinner is individually manufactured in a professional industrial workshop, held to a rigorous 5-step quality control inspection, and guaranteed to last a lifetime. TIP: If you take apart your Valkyrie’s box, you will find a small foam pad at the bottom. You can take it out and put it under your Valkyrie during table spins to reduce noise and protect the surface you’re spinning on. TIP: The grooves around Valkyrie’s triangle accents (and grooves around spinner center) were designed so the user can easily add custom color to them by melting a crayon. TIP: Gentle “slow” spins with the Valkyrie are silent and can be very calming. Great for relaxing! Right-click on image & select "Open image in new tab"/"View image" for full-sized product photo.